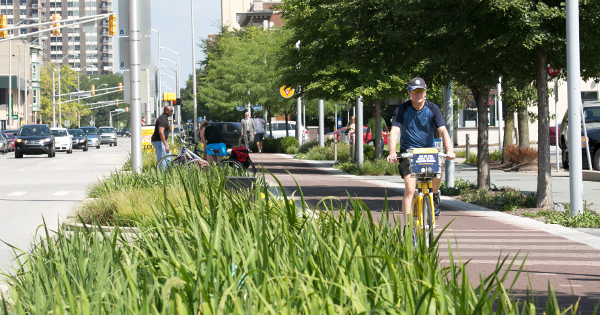 The Indianapolis Cultural Trail, a massively successful reuse of downtown passing lanes. Road space needs to come from somewhere. And with the nation’s infrastructure budgets buckling under road maintenance costs, there’s growing consensus that ever-wider roads are infeasible. Instead, a large and bipartisan majority of U.S. mayors agree, cities should be taking the opposite approach: making their entire systems more space-efficient, cost-effective and economically productive by adding bike facilities in place of extra passing lanes or on-street parking spaces. That’s according to the 2015 Menino Survey of Mayors, released this week by the U.S. Conference of Mayors. That’s 70 percent of U.S. mayors who believe that biking networks are important enough to U.S. roads that it’s worth converting parking and driving lanes to make room. This strategy for connecting bike networks into a usable “minimum grid” (to borrow a phrase from our neighbors in Toronto) isn’t just about bike infrastructure. Removing passing lanes, as Indianapolis did to create its downtown Cultural Trail, can lower auto speeds. Removing street parking, as Salt Lake City did to create its first downtown protected bike lanes, can actually help a district become less dependent on parking for its economic success by improving the alternatives to driving. Both of those projects, which also went hand in hand with big improvements to walking, led to significant upticks in retail growth and neighborhood investment. “Cycling infrastructure emerged as a strong priority for mayors, garnering strong support overall and support — albeit in varying degrees — from mayors of both parties,” the Conference of Mayors wrote in its analysis of the new survey. There was a clear divide between Democratic and Republican mayors. About 80 percent of Democratic mayors agreed with the statement about prioritizing biking improvements over the status quo. GOP mayors split on the question 43 percent to 43 percent, with the remaining 14 percent undecided. For the “small” grants, biking and walking investments came in first. They topped parks, roads, city buildings and eight other possible infrastructure investments as low-cost, high-return projects. “Interestingly, responses did not vary significantly by city size,” the report noted. Mayors are unique among almost all government officials in the breadth of issues they must care about and the depth of knowledge they must have about their city. So maybe it’s no surprise that biking investments tend to stand out to them as good ideas: they reduce public transportation costs, recruit young workers, clean the air and boost public health. Not everyone in cities sees how those benefits fit together on city streets. Then again, few people see cities the way good mayors must.